Oracle of Omaha has frank assessments of the Dow, housing and CEO compensation. OMAHA, Neb. (CNN) -- He played the ukulele. He sang with dancing fruits. He went one-on-one in a comical videotape against NBA star LeBron James. And then in the spectacle long known as the Woodstock for Capitalists, Warren Buffett fielded questions from shareholders at Berkshire Hathaway's annual meeting in Omaha, Nebraska, Saturday. For nearly six hours the 76-year-old billionaire and is counterpart and vice-chairman, Charlie Munger, 83, addressed issues before a crowd of roughly 28,000, handling topics ranging from the glut of private equity deals in the United States to acquisition possibilities overseas. In a brief interview with CNN before the meeting, held in front of a pen holding two large steer munching hay, Buffett remained bullish about the stock market... even amid Dow 13,000 and its best win streak in 80 years. "To get 5.4% of gains per year, the Dow will have to end this century at 2 million. So you better get used to announcing the little milestones," he said. The so-called Oracle of Omaha was also upbeat about the resilience of consumer spending despite gas prices that are approaching record highs. "Gasoline, here, of course is still very cheap compared to costs around the world," he noted. "We can overcome an awful lot of things that seem like temporary problems in this country." But Buffett had a decidedly different view about the housing market. He said too many homes were bought by people carrying mortgages with little or no money down who then hoped to flip them quickly for a profit. "The housing market is sick and it's going to stay sick for a couple of years" he opined. Berkshire Hathaway (Charts, Fortune 500), which reported first quarter profit increases Friday of 12.2 percent, has delivered compounded annual gains at Berkshire of 21.4 percent from 1965 when Buffett took over to 2006. Buffett, as revered for his stock picking as his ethics, collects an annual salary of $100,000. He continued to speak out against exorbitant compensation packages. "The CEO's have a good game. They're not about to give it up," he said. "Somebody said CEO pay has the honor system. The shareholders have the honor and the CEO's have the system." But Buffett himself came under fire from some shareholders, who urged him to divest Berkshire's stake in a PetroChina, a Chinese oil company whose parent does business with the government of Sudan, and is blamed for the genocide in Darfur. Buffett discussed the issue in a previous letter to shareholders that called conditions in Darfur "deplorable." But he noted at the meeting that, "There is zero connection between our investment in PetroChina and what's happening in the Sudan." Nevertheless, Buffett allowed about 45 minutes of discussion on the issue of divestment alone. Buffett, who last year pledged to give the bulk of his estimated $44 billion to charity, acknowledged that some of the throngs of disciples who hung on every quip and anecdote Saturday would love to succeed him. Buffett said in his shareholders letter in March that Berkshire's board of directors knows who would succeed him as chairman if he dies suddenly. 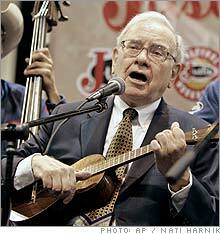 But in a surprise announcement, Buffett said he wants to split his dual functions. He said he is looking for a chief investment officer who possesses "independent thinking, emotional stability and a keen understanding of both human and institutional behavior." Buffett said the search would accelerate after the annual meeting and the folksy billionaire said it would be conducted much like "American Idol." When asked if he would be more like Paula Abdul or Simon Cowell in judging candidates, Buffett said, "I guess I'm a little more like Simon."